question_answer4) Microorganisms produce ________ by acting upon the dead plants. question_answer5) Identify the wrong statement. question_answer9) Which of the following is not a forest product? question_answer12) Which of the following is incorrect? question_answer13) Select the chain that contains primary consumers. question_answer14) Select the one that is not a forest product. question_answer17) Some herbs and plants that were used in ancient times for making drugs and are even now used for the same purpose. Which of the following is not one of these? question_answer19) Select the country that is the largest producer of fuel wood in the world. question_answer20) The cricket bats are made out of wood of which of the following? question_answer22) Which of the following animals live in deeper areas of forests? question_answer23) Choose the correct statement. question_answer24) In the forests there is interaction between. question_answer26) In India the area under forest cover is about ....... of the total area? question_answer36) Which of the following sets represents primary consumers? question_answer39) Which of the following play a very important role in causing rainfall? question_answer40) Which of the following produce food? question_answer41) DIRECTIONS: Match column I with column II and select the correct answers using the code given below the columns. (B) Canopy (ii) Branchy part of a tree above the stem. (C) Decomposers (iii) Green lungs. question_answer42) DIRECTIONS: Match column I with column II and select the correct answers using the code given below the columns. question_answer43) DIRECTIONS: Match column I with column II and select the correct answers using the code given below the columns. question_answer44) DIRECTIONS: Match column I with column II and select the correct answers using the code given below the columns. question_answer45) DIRECTIONS: Read the passage (s) given below and answer the questions that follow. Passage - 1 Forests are a useful natural resource for us. Forests serve as green lungs and water purifying systems in nature. Forests provide shelter to many animals, birds and insects. Many animals like boar, bison, and jackal elephant live in the deeper areas of forests. And forests protect us from droughts and floods. Rajendra Singh, nicknamed the "water man" is a pioneer in the field of water conservation, his main area of activities being drought prone western Rajasthan. He was awarded a prize for his work in 2001. Which of the following awards did he receive? question_answer46) DIRECTIONS: Read the passage (s) given below and answer the questions that follow. Passage - 1 Forests are a useful natural resource for us. Forests serve as green lungs and water purifying systems in nature. Forests provide shelter to many animals, birds and insects. Many animals like boar, bison, and jackal elephant live in the deeper areas of forests. And forests protect us from droughts and floods. Which of the following is a source of food and shelter for animals, birds and insects? question_answer47) DIRECTIONS: Read the passage (s) given below and answer the questions that follow. Passage - 1 Forests are a useful natural resource for us. Forests serve as green lungs and water purifying systems in nature. Forests provide shelter to many animals, birds and insects. Many animals like boar, bison, and jackal elephant live in the deeper areas of forests. And forests protect us from droughts and floods. Which of the following is correct for forests? question_answer55) DIRECTIONS: The questions in this segment consists of two statements, one labeled as "Assertion A" and the other labeled as "Reason R". You are to examine these two statements carefully and decide if the Assertion A and Reason R are individually true and if so, whether the reason is a correct explanation of the assertion. Select your answers to these items using codes given below. Assertion (A): A Food chain will never begin if there are no green plants. Reason (R): Green plants produce food by the process of photosynthesis. question_answer57) DIRECTIONS: The questions in this segment consists of two statements, one labeled as "Assertion A" and the other labeled as "Reason R". You are to examine these two statements carefully and decide if the Assertion A and Reason R are individually true and if so, whether the reason is a correct explanation of the assertion. Select your answers to these items using codes given below. Assertion (A): Loss of top soil is called soil erosion Reason (R): Heavy rains and deforestation causes loss of soil. question_answer59) DIRECTIONS: Read the following two statements carefully and choose the correct options. (i) In an ecosystem, number of producers should be more than consumers. (ii) Number of decomposers should be large. question_answer60) DIRECTIONS: Read the following two statements carefully and choose the correct options. (i) The branchy part of a tree is canopy (ii) Shrubs and short trees form a crown. question_answer62) DIRECTIONS: Carefully observe pictures given below and answer the following questions. 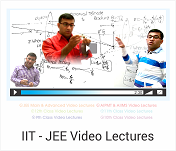 Look at the following diagram and answer the following questions. What does the diagram represent? question_answer64) DIRECTIONS: Carefully observe pictures given below and answer the following questions. Study the given figure. What should come in the empty box? question_answer65) DIRECTIONS: Carefully observe pictures given below and answer the following questions. 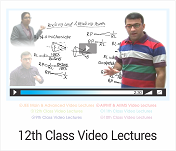 What could arrow 1 and 2 represent in the above diagram? question_answer68) Which of the following is a canopy? question_answer70) Which of the following convert the dead plants and animals to humus? question_answer71) Which of the following is called green lungs? question_answer72) Which of the following feed upon dead plant and animal tissues? question_answer76) Which of the following is called as dynamic living entity? question_answer77) Which of the following binds the soil together? question_answer79) If plants stop releasing oxygen into the atmosphere which of the following might happen? question_answer81) Which of the following leads to the destruction of ecosystem? question_answer82) Loss of top soil is called _______ . question_answer84) Which of the following process is responsible for release of carbon dioxide by the animals? question_answer85) Which of the following provides nutrients to the seedlings to grow in forests? question_answer86) DIRECTIONS: Match Column I with column II and select the correct answers using the code given below the columns. question_answer87) DIRECTIONS: Match Column I with column II and select the correct answers using the code given below the columns. question_answer90) DIRECTIONS: Read the passage (s) given below and answer the questions that follow. 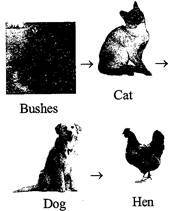 Passage - 1 Plants and animals are interdependent on each other. Plants give out oxygen which animals take in during respiration. What will happen if more plants are cut? question_answer91) DIRECTIONS: Read the passage (s) given below and answer the questions that follow. Passage - 2 Deforestation began by clearing forests so that crops could be grown. Forests serve as water purifier system in nature. Forests are good source of plants, we should not destroy the forests. What is a forest? question_answer93) DIRECTIONS: Read the passage (s) given below and answer the questions that follow. Passage - 2 Deforestation began by clearing forests so that crops could be grown. Forests serve as water purifier system in nature. Forests are good source of plants, we should not destroy the forests. Which of the following activities cause destruction of ecosystem? question_answer94) DIRECTIONS: The questions in this segment consists of two statements, one labelled as "Assertion A" and the other labelled as "Reason R". You are to examine these two statements carefully and decide if the Assertion A and Reason R are individually true and if so, whether the reason is a correct explanation of the assertion. Select your answers to these items using codes given below. Assertion (A): Different layers of vegetation are a source of food and shelter for animals, birds and insects Reason (R): The animals like boar, bison, Jackals and elephants live in deeper areas of forests. question_answer95) DIRECTIONS: The questions in this segment consists of two statements, one labelled as "Assertion A" and the other labelled as "Reason R". You are to examine these two statements carefully and decide if the Assertion A and Reason R are individually true and if so, whether the reason is a correct explanation of the assertion. Select your answers to these items using codes given below. Assertion (A): All animals depend ultimately on plants for food. Reason (R): Organisms which feed on plants afterwards get eaten by other organisms and soon. question_answer96) DIRECTIONS: The questions in this segment consists of two statements, one labelled as "Assertion A" and the other labelled as "Reason R". You are to examine these two statements carefully and decide if the Assertion A and Reason R are individually true and if so, whether the reason is a correct explanation of the assertion. Select your answers to these items using codes given below. Assertion (A): When an animal dies in the forest, it becomes food for vultures, crows Jackals and insects. Reason (R): There is no waste in forests. question_answer97) DIRECTIONS: The questions in this segment consists of two statements, one labelled as "Assertion A" and the other labelled as "Reason R". You are to examine these two statements carefully and decide if the Assertion A and Reason R are individually true and if so, whether the reason is a correct explanation of the assertion. Select your answers to these items using codes given below. Assertion (A): In an ecosystem all food chains are linked. Reason (R): There are many food chains in an ecosystem. question_answer101) DIRECTIONS: Read the following two statements carefully and choose the correct options. (i) Trees form the middle layer in a forest (ii) Trees have crowns of same size (iii) There are no creepers and climbers in a forest. question_answer102) DIRECTIONS: Carefully observe pictures given below and answer the following questions. 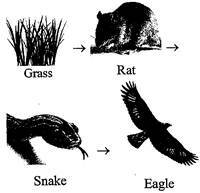 Which of the following is not a correct food chain? question_answer103) DIRECTIONS: Carefully observe pictures given below and answer the following questions. Look at the following picture of canopy and understory in a forest and answer the following question Look at the above diagram. In this diagram A shows. question_answer104) DIRECTIONS: Carefully observe pictures given below and answer the following questions. 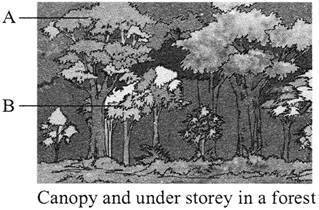 Look at the following picture of canopy and understory in a forest and answer the following question In this diagram B shows.